In biology, an organism is any individual living thing. It is easy to recognize a living thing, but not so easy to define it. Animals and plants are organisms, obviously. Organisms are a biotic, or living, part of the environment. Rocks and sunshine are parts of the non-living environment. Organisms usually have five basic needs, to continue their metabolism They need air, water, nutrients (food), energy and a place to live. However, not all living things need all these at the same time. Many organisms do not need access to air at all. Most organisms are so small that they cannot be seen with the naked eye. You need a microscope to see them. They are called microorganisms. 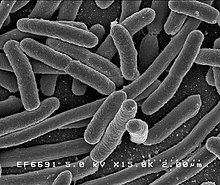 Organisms can be made up of just one cell. 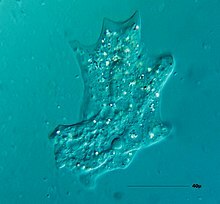 They are called unicellular organisms or single celled organisms. Examples include bacteria, and protozoa such as the Amoeba and Paramecium. The Tree of Life project works on the relationships between living things. Identifying a LUCA (last universal common ancestor) is one of its main aims. The LUCA is estimated to have lived some 3.8 billion years ago (sometime in the Palaeoarchaean era). ↑ Doolittle, W.F. (2000), "Uprooting the tree of life" (PDF), Scientific American, 282 (6): 90–95, doi:10.1038/scientificamerican0200-90, PMID 10710791. ↑ Glansdorff, N.; Xu, Y; Labedan, B. (2008), "The last universal common ancestor: emergence, constitution and genetic legacy of an elusive forerunner", Biology Direct, 3: 29, doi:10.1186/1745-6150-3-29, PMC 2478661, PMID 18613974. ↑ 3.0 3.1 Hesman Saey, T. (2010). "All modern life on Earth derived from common ancestor". Discovery News. This page was last changed on 22 January 2019, at 13:38.